Among the African Batwa Pygmies, from the Congo Kasai Valley, at the St. Louis Exposition, was a bright little man, "Ottobang," who taught me this figure. 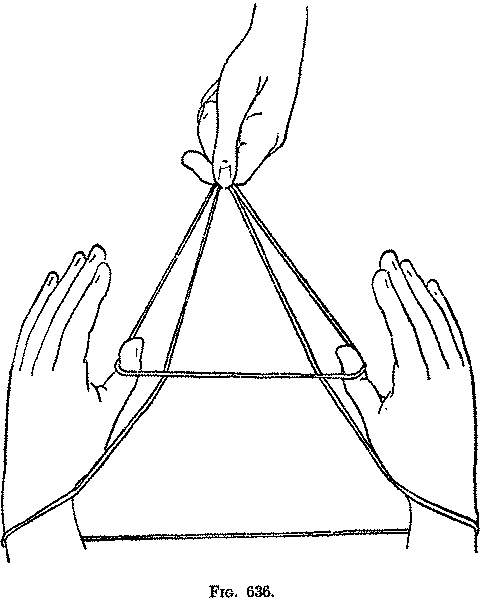 First: Put both hands through the loop of string, up to the wrists, and take up between the thumb and index of each hand a short piece of the upper wrist string. 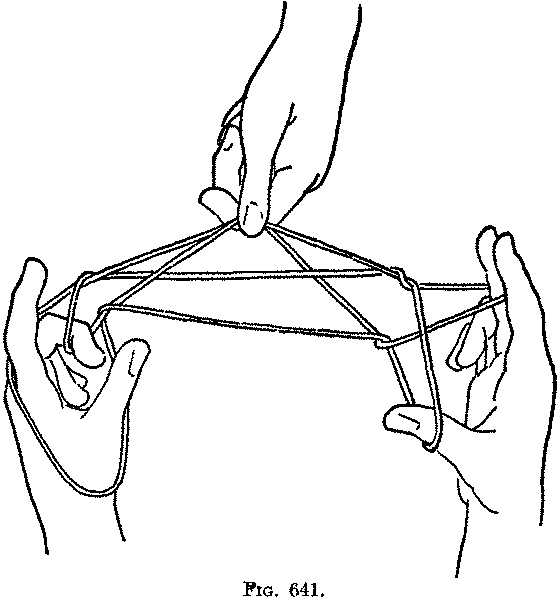 Then make a small hanging ring in this string, by passing the string held by the right hand toward you over the left hand string (Fig. 632). Turn this ring up, and put first the right thumb (Fig. 633) and then the left thumb (Fig. 634) away from you into the ring, and separate the hands (Fig. 635). 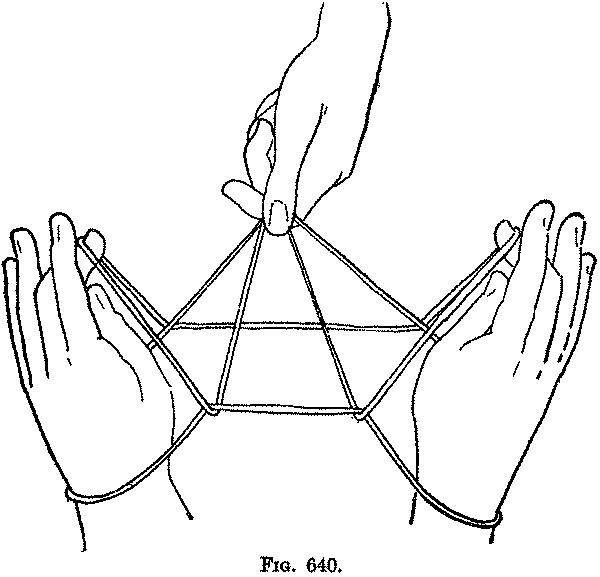 Second: Get another person to take between the thumb and index the cross formed in the centre of the figure by the far thumb and near wrist strings, and holding the two strings firmly, pull them away from you (Fig. 636), keeping them taut, or slightly relaxing them as the movements require, but not letting go until told to do so. 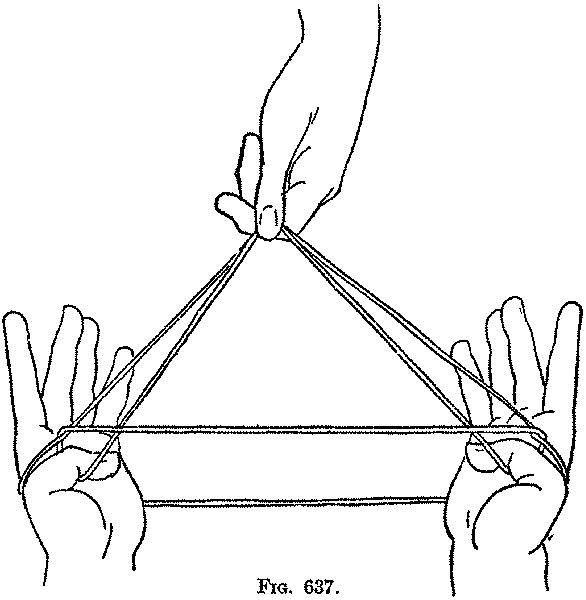 Third: Bend each thumb down, to hold firmly in place the far thumb string, and draw the hands toward you (Fig. 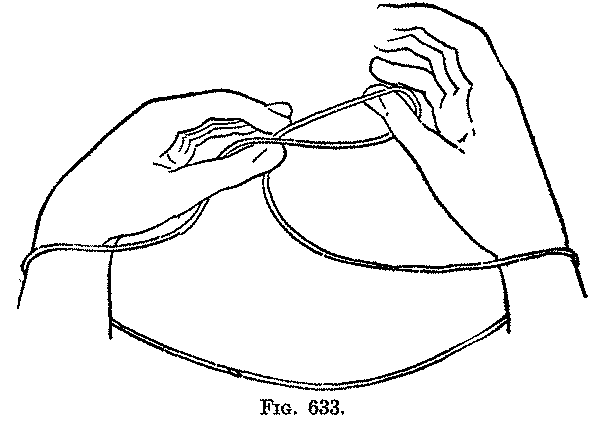 637) through the wrist loops, keeping the loops securely on the thumbs (Fig. 638). Fourth: Turn the hands up with the palms away from you (Fig. 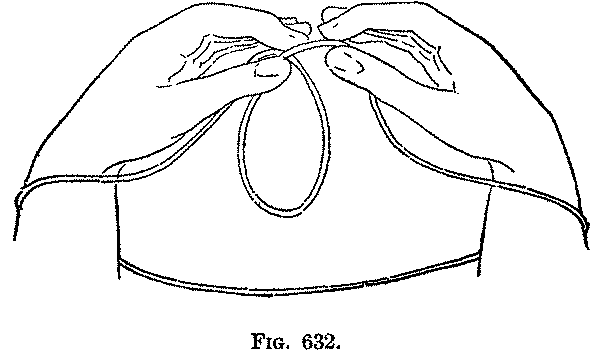 639, Left hand), and slip each hand up through the thumb loop to the wrist (Fig. 639, Right hand). 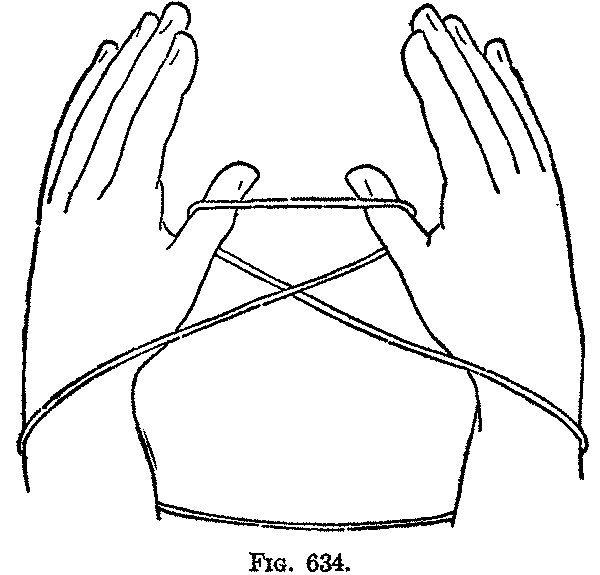 Fifth: With the back of each middle finger pick up, from below, the oblique string passing around the two strings of the wrist loop, and return the middle finger to its former position (Fig. 640). Sixth: Turn the palms slightly toward you, and bend each middle finger down over the near middle finger string, and holding the middle finger loop (Fig. 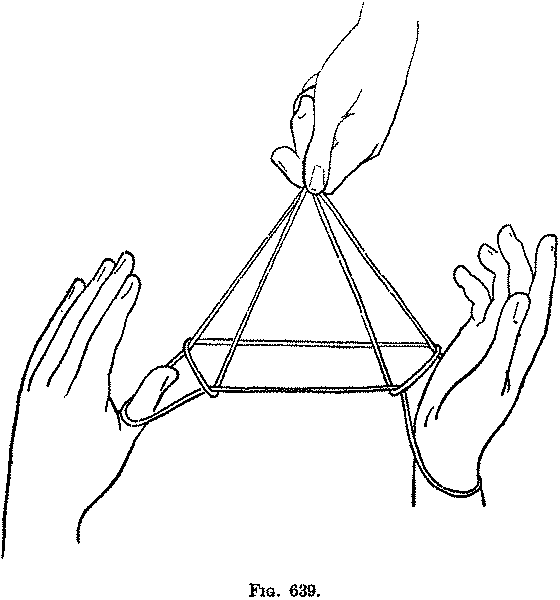 641, Left hand) tightly in position, draw each hand toward you through the wrist loop, which should be caught in passing on the back of the thumb. Seventh: Turn the palms toward each other; pull each middle finger loop further through the thumb loop, and turning the palm upward, straighten the middle finger outside of the thumb loop (Fig. 641, Right hand). Eighth: The figure is extended by spreading the thumbs and middle fingers widely apart and separating the hands (Fig. 642). 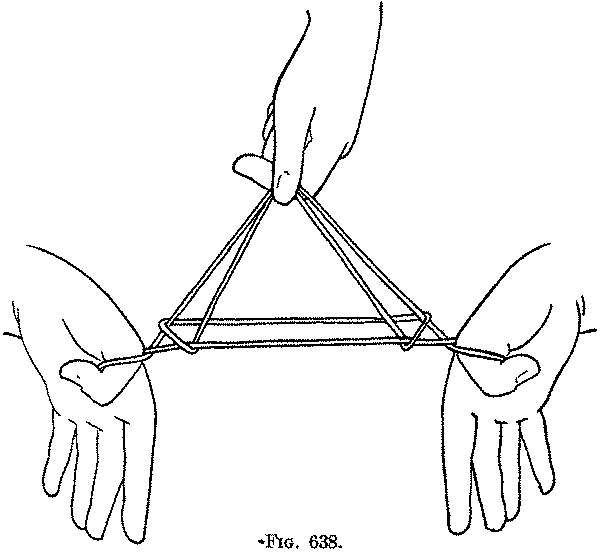 The strings held by the second person are now released. 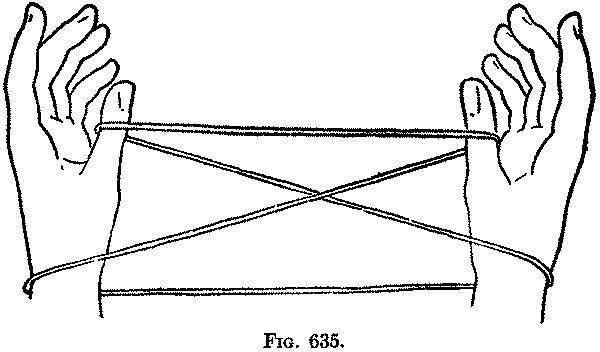 So far as I know, this figure is the first African string game that has ever been described. The nature of the Batwas and their isolation in the heart of Africa would not lead us to expect to find among them a relatively complicated figure, and make any resemblances which this figure may bear to other figures doubly interesting. We see at a glance that it has much in common with the "Caroline Islands Diamonds" and the "Turtle." The finished pattern is identical with the pattern formed after the Sixth movement of the Eskimo "Mouth"; hence you can go on and finish the "Mouth" from the finished pattern of the "Pygmy Diamonds." This is the only case, in my experience, where the finished pattern of one figure occurs as a stage in the development of another entirely different figure.